Mangrove jelly fish (Cassiopea xamachana) is so called because it is mostly found in the roots of mangroves in the southern Gulf of Mexico, Caribbean, and other tropical waters. They are also called the Upside Down jellyfish because they tend to settle upside down in muddy and shallow waters. On first sight, they do not really resemble a jellyfish, instead looking more like a sea anemone, or a bluish green flower on the waterbed. However, this appearance also provides the jellyfish with very effective camouflage and protects it from likely predators. The jellyfish catches it food, mostly plankton and zooplankton, when it gets paralyzed by these stinging cells. The mangrove jellyfish also have venom filled nematocysts on its tentacles for the same purpose of stinging its prey and then transporting it near the mouth for ingestion. 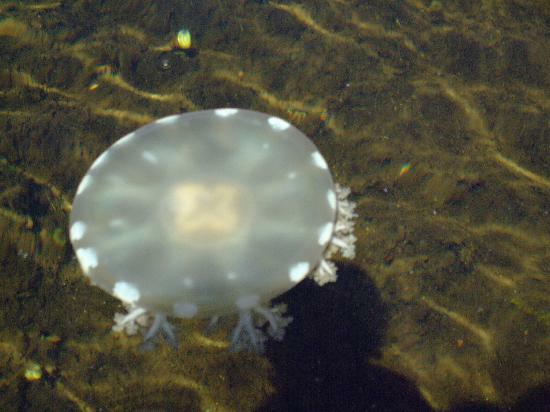 You may be surprised to know that unlike other jellyfish, the mangrove jellyfish does not have only a single mouth. In fact, it has mutated to form a number of secondary mouths. The primary mouth reduces the food into tiny fragments, which are then ingested by these numerous secondary mouths. As far as humans are concerned, they are most likely to be caught up in the mucus columns in the water that contain stinging cells of the mangrove jellyfish. The stinging cells are slightly toxic in nature and can cause severe itching. However, if a human disturbs an entire swarm of mangrove jellyfish, they will all launch upwards towards the surface of the water together and release more stinging cells into the water. This situation can be vary dangerous to humans.